I haven't been very active on the blogs lately as I've had some health issues to deal with. I don't want to bore you too much, but I know many in the crafting community have health issues or care for some one who does so I'll briefly explain what's been going on. I was diagnosed with a condition called temporomandibular joint dysfunction(TMJD) - which for me means the disc between the upper and lower jaw bones is displaced and damaged and so the bones rub together and the disc stops me from being able to open my mouth very wide. 2 months ago I had a terrible couple of hours of pain and from that I have been told that the swelling from my jaw is compressing some nerves (occipital and trigeminal) so I get pain from that too. Luckily, I have still been able to design and even make the occasional card, so I'll share one of latest bundles and a tutorial too. 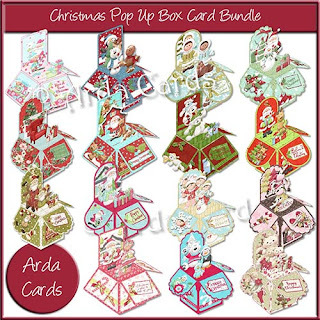 I love Pop Up Box Cards so I decided to make a Christmas bundle and another everyday bundle. I also finally made a video tutorial as I had to make a birthday card for my daughter's friend. Here is the Christmas bundle too. 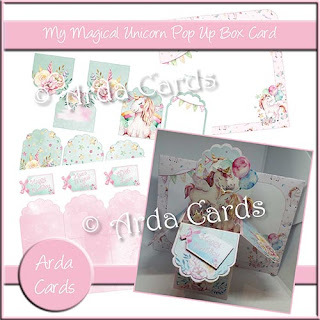 And the beautiful unicorn card I made in the tutorial - I just love unicorns and so does my daughter's friend. And I think this card is just adorable! That's all for now but I'm going to try really hard to keep the blog up to date in the future!